I was born on Good Friday, April 17th, 1987. Raised a Roman Catholic, I used my understanding of Catholic social teaching to become an advocate for civil and human rights, a vocation that led me to Morehouse College in 2005. While at Morehouse, I taught tournament-level chess to elementary, middle, and high school boys and sang in the Morehouse College Glee Club. I also led several campaigns to free a Chatham County, Georgia inmate, Troy Davis. In addition to my civic activities at Morehouse, I joined the Martin Luther King Jr. Chapel Assistant Program — an organization designed to expose Morehouse students to theological principles for the purposes of parish ministry and seminary education after college. Consequently, I felt called to religious life and attended the Candler School of Theology at Emory University in Atlanta in 2010. While a student at Candler, I studied under a civil rights legend, the Rev. Dr. Barnard Lafayette Jr., and the Howard Thurman Scholar, Dr. Luther Smith. At Candler, my path led toward the Episcopal Church. Due to my upbringing, I initially pursued Roman Catholic priesthood. However, after meeting Bishop Robert Wright (then the rector of St. Paul’s Episcopal Church in Atlanta), discovering the scope of social work in the Episcopal Church and realizing that I wanted a family in the future, I decided to continue my discernment in the Episcopal Church and was received in 2012. While earning my master’s degree in Divinity, I worked at Holy Comforter Church, where about 60% of the congregation suffers from mental illness. In May of 2013, I received my master of divinity degree while interning at St. Paul’s Episcopal Church of Atlanta. While there, I led youth confirmation, revitalized the youth group, and helped with the food pantry. In August of 2013, I received the call to serve as the youth minister to St. Paul’s Ivy Episcopal Church of Charlottesville, the first full-time youth minister that congregation had ever had. In December of 2014, I was made a postulant for Holy Orders by the Episcopal Diocese of Virginia and am currently undergoing formation. 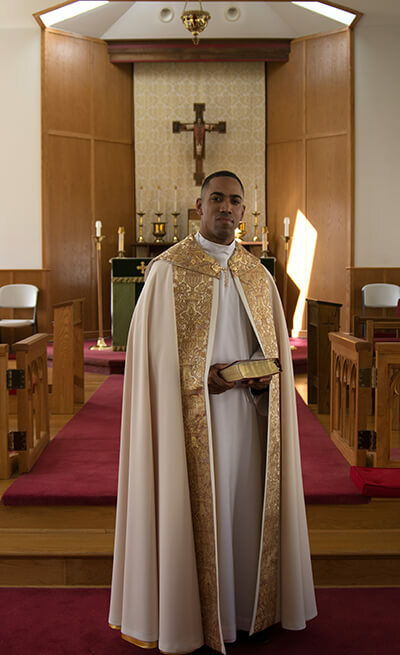 And at the recommendation of Virginia’s Committee on Priesthood and at the encouragement of our bishops, I completed the year of Anglican Studies at Virginia Theological Seminary. The Post-Graduate Diploma in Anglican Studies program is designed to prepare individuals over a year’s time who have earned their first theological degree at a non-Episcopal seminary, and/or who have been ordained in other denominations, for ordained ministry in the Episcopal Church. I currently serve as rector of St. Michael’s Episcopal Church in Yeadon, Pennsylvania. I am a former member of the Episcopal Diocese of Virginia Commission on Reconciliation with Truro Anglican Church, a Church that left the Episcopal Church over human sexuality disagreements. I was inducted into the Martin Luther King Jr. Board of Preachers and Scholars in 2014. I am a proud member of Alpha Phi Alpha Incorporated and have served as an NAACP president for both the states of New York and Georgia Youth Divisions. In my spare time, I play the violin and cello and am extremely devoted to my family, friends, and mentors. St. Michael's Church is a Christ-centered congregation of individuals and families drawn together by sacraments, worship, education and work serving its members, as well as the local and world communities, through Faith, Witness, Outreach and Fellowship.